The Bucket Theory – Getting It Right! 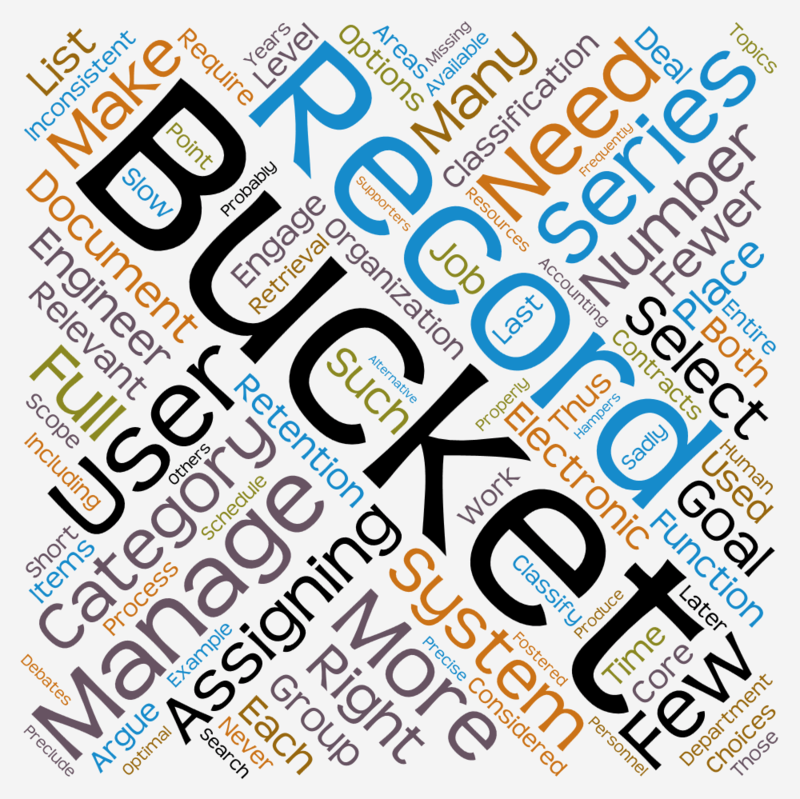 Few topics have fostered more debates in the last few years than the optimal number of record series categories or “buckets.” In an electronic document management systems, when users need to classify records they must place it in a bucket or category. Some argue that too many buckets slow the process and produce inconsistent assignments. Others argue that too few buckets preclude the precise classification of records and hampers later search and retrieval. So who is right – the supporters of fewer or those of more buckets? Sadly, neither is right, because both are missing the point. The goal is not how many buckets or alternative choices are available in a records series or classification systems. The goal should be how many choices should be considered when making an assignment. From a classification perspective, users should not focus on the full complement of record series including 100 or 500 items. The organization is concerned that enough record series to adequately classify records to the level needed for classification, records retention, retrieval, etc. If there are too few categories of a very generic scope – e.g., just “contracts” instead of union contracts, leases, purchase orders, etc. – a second level of indexing or description would be needed for refinement. Too many categories are difficult to manage, resulting in inconsistent assignments as users have an overwhelming number of options for their records. However, users do care about the number of categories when they make assignments. Fewer categories mean faster and more consistent assignments among all users. More categories require more time, more thinking, and different users making inconsistent selections. Recently, IT professionals have jumped on the “fewer is better” bandwagon (fewer buckets) when rolling out SharePoint or other electronic document management systems. They know these systems change the corporate culture and require users to “do something” to make them function successfully. Thus, they want to simplify the requirements they place on users and, for classification, assigning record series from a smaller set of options in considered simpler. So how can these goals be reconciled? The answer is simple, but largely ignored – enable users to select from the record categories relevant to their work, rather than mandating consideration of all options including obviously irrelevant items. For example, an engineer engaged in engineering projects would normally create or receive records in a few engineering categories, but probably never deals with records in categories such as marketing, tax, accounting, etc. Engineers should be deal with categories inclusive of their job scope. Similarly, human resources personnel manage areas such as recruitment, personnel actions, benefits, health and safety, etc., but probably never need categories in engineering, construction, property maintenance, etc. Yet, both these groups, depending on position, may occasionally engage in budgeting, internal reporting, policies and procedures, or other areas outside of their core responsibilities. Thus, each group or individual needs the right number of buckets based on their core functions and other functions they might engage in to perform their job. For example, engineering might need some 17 categories, Human Resources may need 47, Legal may need 22, Accounting may need 19, etc., regardless of the number of categories available to the entire organization in the full records retention schedule. Of course, once users select a relevant record series to link to their record or document (or box in a paper system), the retention period (related to the record series) would be applied. So, how do you make this happen? First, develop the full records retention schedule for the entire organization with the “right” number of categories to properly describe the organization’s records. Then, let each group or departments select the record series relevant for the types of documents and records used in their regular work. Finally, publish the record series by department either as a PDF or import file for your electronic document management system. Users can then select the relevant record series from their own “short list,” saving time and promoting accuracy. Ideally an electronic document management system should manage this process. However, I am not yet of aware of any system that can manage this task properly. Besides letting users select their “short list” of record series, the system should also track the user’s behavior and rank the most frequently used record series – placing the most frequently used record series at the top of list where they are easiest to find. If users demand such functionality, I hope the vendors will respond.